Hop into VR to see through the eyes of a nocturnally-adapted primate. Remind your friends to take care of themselves with Purple Gorilla, learn how to code ai with Monad, and snap photos of houses to determine their market values. These and many other technologies will be shown. Enjoy grilled cheese, great music, and drinks while you peruse the demos. Computer Science and the DALI Lab are excited to announce Technigala, an opportunity for you to experience some amazing technology and design projects from 18W. Prove you have read articles online with ReallyRead.it. Use AR while hiking to make sure you don't get lost with HikAR, and have insane meme battles with friends with MiAM. These and many other amazing technologies will be shown. Technigala will be held on March 6 from 6:00-8:00 pm in the Hanover Inn Ballroom. Students from The DALI Lab, CS98 (Senior Design and Implementation Project), and CS22 (3D Digital Modeling) will be showing off their work from the term! There will be great food and music! The Pitch is a yearly event in which twenty groups pitch their big ideas in two minutes or less. Winners will be chosen by a panel of judges and the audience. There will be four winners. Two will be chosen by the audience for the categories Best Pitch, and Most Innovative. The other two will be chosen collaboratively by a panel of Judges put together by DALI and DEN. One will be the DALI winner and receive design/development support from the DALI Lab, the other will be the DEN winner and will receive DEN support. All four winners will receive $1000! 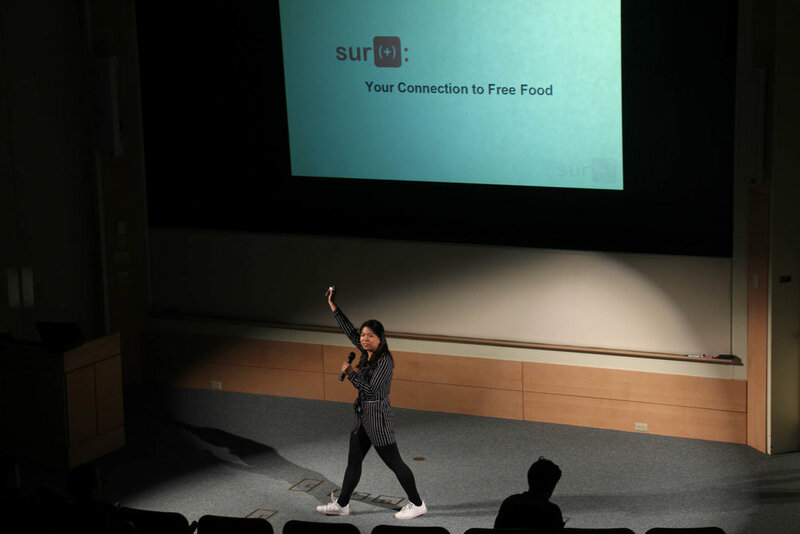 The Pitch is a fun, fast-paced event. Show support for the students, faculty and staff who are pitching, and cast your vote for the winners! Food will be served. Winners will be announced at the end of the event. Winners are selected based on originality of the idea, potential impact, feasibility of the idea, strength of the team, and quality of the pitch. DALI Workshops: Creating iOS Apps! Creating iOS apps: Modern methods for creating smartphone apps make the process of development very fluid and understandable, but it can be hard to get started. Come to this workshop to explore the basic methods for creating your very own iOS application using Apple’s young but powerful language Swift on February 5th at 5:30 pm in the DALI Lab. 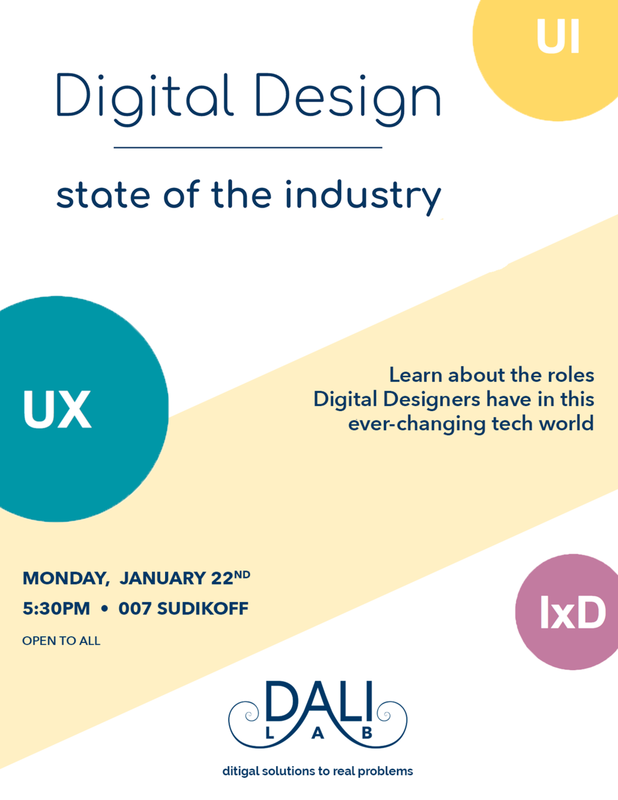 Come to this workshop to learn about a variety of digital design careers including UX, UI, IxD, and Product Design. You’ll leave with a better understanding of what skills recruiters are looking for and what responsibilities come with these roles. Join us for Technigala! This event is a collaboration between the Computer Science Department and the DALI Lab, and will display some amazing work from the 17F term. Technigala will be held on November 14 from 6:00-8:00 pm in the Jones Media Center, Baker Library. There will be great food and music! Join us the for Computer Science Unleashed 17S event! This demo will showcase the amazing work of the DALI Lab, CS98, CS52, and CS27. 30-40 groups from three classes and the DALI Lab will be presenting their work for the term and competing for the best demo prize. You can vote by downloading the DALI App and being at the event. Computer Science Unleashed will be held in the Hanover Inn Ballroom from 5:30-7:00 PM on May 30 2017. We hope to see you there! Please RSVP to the event by visiting our Eventbrite page. This Monday, April 17, at 5:30pm the DALI Lab is holding an Illustrator workshop! Illustrator is one of the tools most used for logo/icon design. If you are considering applying to the DALI Lab, or want to learn Illustrator, we would love to have you! Come to the DALI x CS98 End of Term Event on March 8 at the Top of the HOP! The Event will run from 5:30-7:00pm and 20 project groups will showcase what they have been working on during 17W in a science fair style. There will be catering, a cash bar, and great music! For more information, or to RSVP to the event, please visit our Eventbrite. And bring your friends/pets/enemies/anyone! Come Watch The Pitch 17W! Winners are selected based on originality of the idea, potential impact, feasibility of the idea, strength of the team, and quality of the pitch. Applications close on February 6th and we hope to see you on Thursday, March 2nd at 7 PM in Filene Auditorium. Twenty people will pitch their big ideas in two minutes or less. Help choose the winners, May 19th from 7-9 pm in Filene Auditorium. Winners are selected based on originality of the idea, potential impact, feasibility of the idea, strength of the team, quality of the pitch. Hope to see you on Thursday, May 19th at 7 PM in Filene Auditorium. Or check out the FAQ page for more info.